The Fuzztones have certainly achieved legendary status as cult faves during their 36 year career. Their fiery brand of Garage-Psych Punk pre-dated the entire « Garage Revival » of the 1980s and has influenced hundreds of groups, from The Hives to The Horrors. Born in the summer of 1980 in the bowels of NYC’s Lower East Side, The Fuzztones were soon regulars at legendary NYC hotspots such as CBGB, and the Mudd Club. By utilizing the fuzzbox (an antiquated effects pedal used by many 60’s groups to achieve overly distorted « psychedelic » guitar sounds), the band created a raunchy sound they referred to as « Grunge »…(On their 1984 debut single, « Bad News Travels Fast », lead guitarist Elan Portnoy is credited as playing « lead grunge », at least a decade before the Seattle Grunge Invasion), and the band was nicknamed « The Gurus of Garage Grunge. 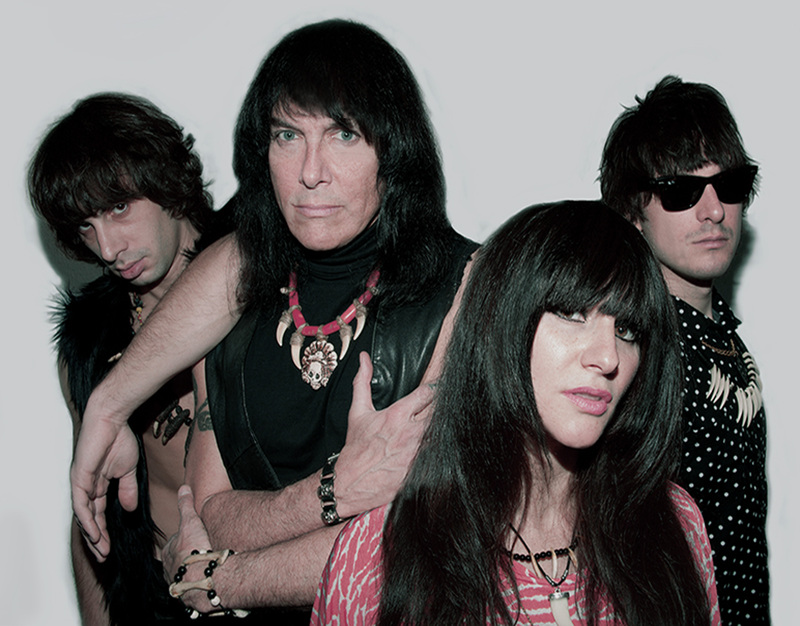 » Complete with paisley and leather attire, genuine human bone necklaces, The Fuzztones influenced the fashions of musicians as diverse as the Hoodoo Gurus (who also modified the Fuzztones infamous skull and crossed Vox Phantom guitars logo for use on one of their album covers) to Ian Astbury and Marc Almond (who aped The Fuzztones by wearing black turtlenecks with bone necklaces) to the Dwarves, whose X-rated logo was stolen from the Fuzztones « Lysergic Ejaculations » cover. Mudhoney member Mark Arm has cited frontman Rudi Protrudi as a main influence. German superstars Die Artze even sport Fuzztones t-shirts in their promo photos, as do platinum-selling Finnish rockers, 69 Eyes. The band’s classic video for « Ward 81 » even inspired the legendary Ramones, whose « Psychotherapy » video copies several scenes directly from the Fuzztones’ masterpiece, as did the glitter-rock docu-film « Velvet Goldmine »! The band’s first European tour in 1985, a 3 month onslaught of England, Wales, Scotland, Germany and Italy, firmly established the band with a dedicated, and avid following that continues to this day! Their 1985 debut studio LP, « Lysergic Emanations » has achieved major cult status, and has been released by 5 different labels over the last 16 years, and is currently enjoying it’s sixth resurgence on Germany’s Houndgawd label. The Fuzztones have toured Europe fervently since 1985, and have headlined major venues in Italy, Spain, Greece, France, Norway, Sweden, Belgium, Wales, Scotland, Austria, Germany, Czech Republic, Portugal, Denmark and Finland, as well as Canada, Israel, Prague, Serbia, Croatia and Mexico. They have appeared on over 80 vinyl and CD releases, including at least 15 albums, countless singles, and compilations, not to mention 5 videos, several television and radio appearances, and countless major press articles (NME, Sounds, Melody Maker, Rockerilla, Hit Parade, US,and more) and were the only band involved in the ’80s « Garage Revival » to obtain a major label record deal (RCA). This year England’s Easy Action label released « Psychomania, » a 7 cd/1 dvd boxset and will release the entire Fuzztones back catalogue on vinyl before the end of 2016. Meanwhile, Germany’s FanPro Publishing will be releasing Fuzztones frontman, Rudi Protrudi’s autobiography, « The Fuzztone, » scheduled to hit the stands at the end of June 2016. More than any other band, it’s The Fuzztones who are responsible for initiating the Garage Movement that began in the ’80s and continues to this day. IN FUZZ WE TRUST!